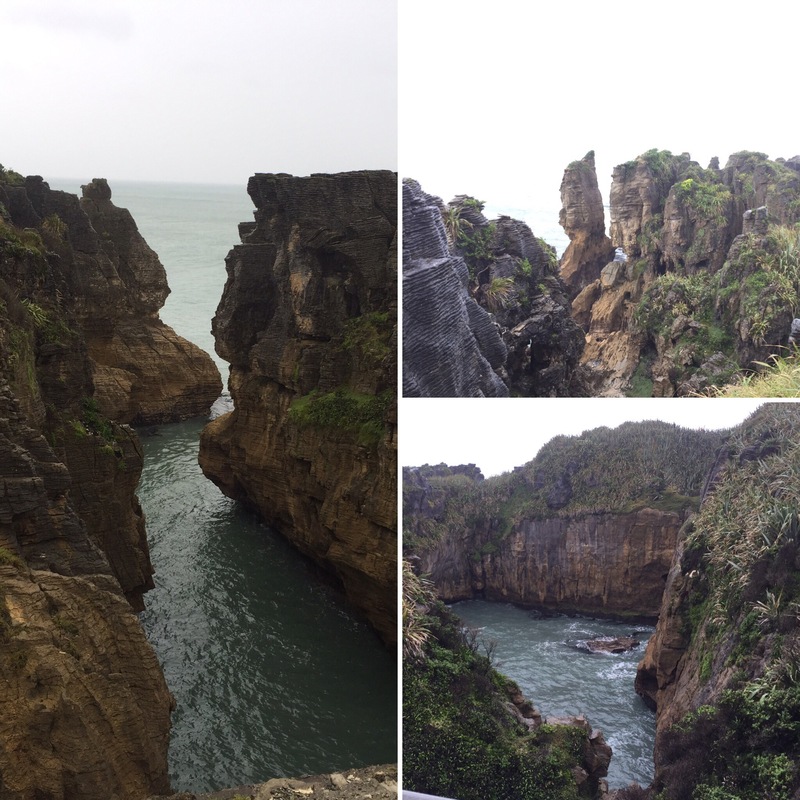 Our next stop was the the Punakaiki Pancake Rocks. 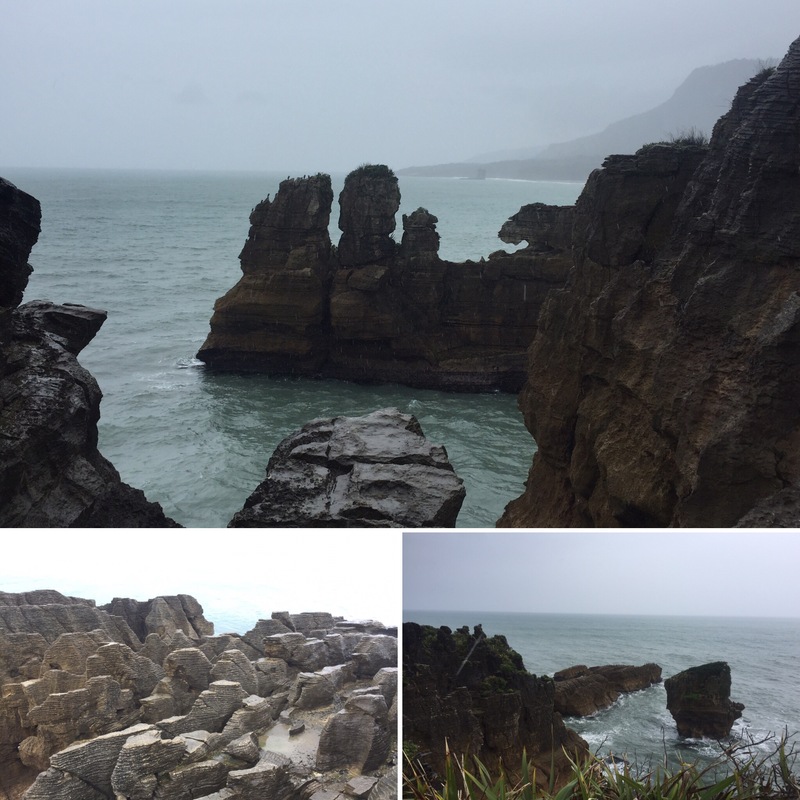 It was raining really heavily by this point so we really rushed round the rock formations which was a shame as it was pretty cool. 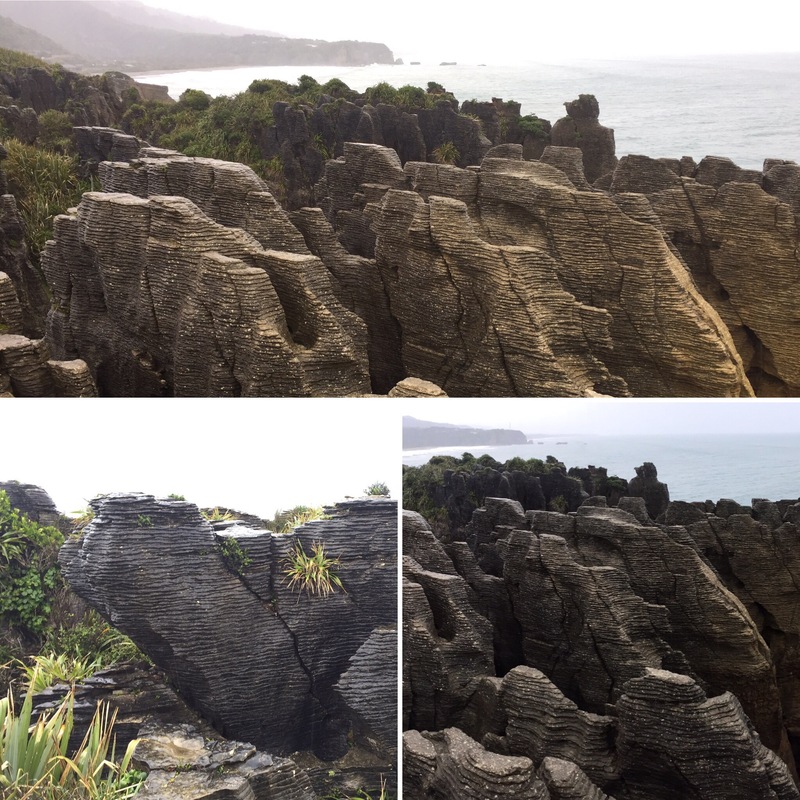 The rocks were formed in loads of really thin layers which were all stacked on top of each other (a bit like their namesake, a stack of pancakes). There were so many of them in the cliff and sticking up out of the sea as well – I think if it had been a clear day they would have looked spectacular. Our trip to Lake Mahinapua was a bit pointless really. We were taken to a holiday park style accommodation which was in the middle of nowhere with nothing else around it except for Lake Mahinapua itself. This wouldn’t have been so much of an issue except for the rain which meant there was absolutely nothing to see – just rain and low cloud. 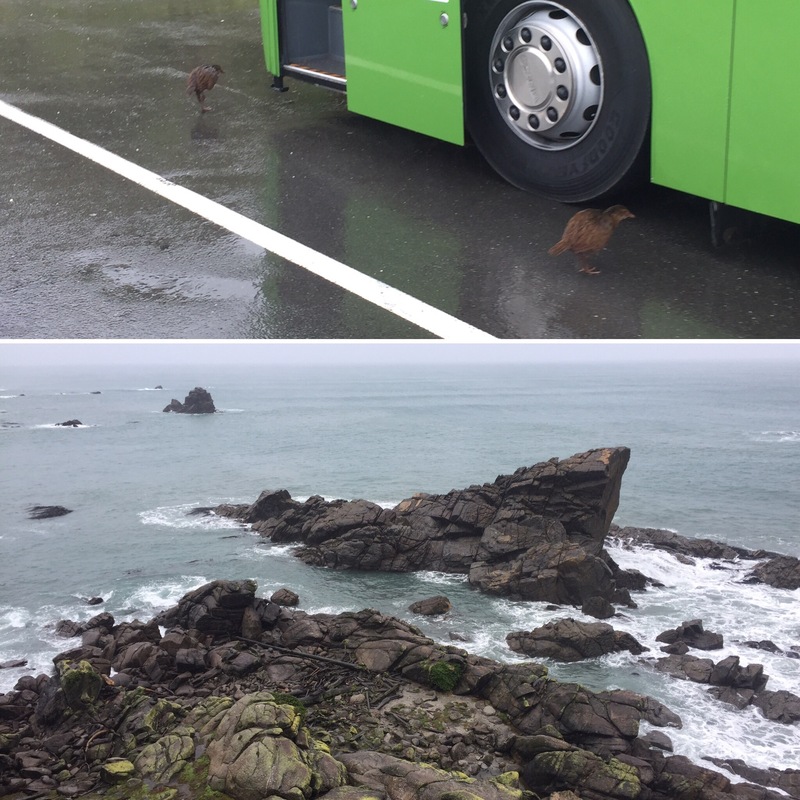 That was the issue with the Kiwi Experience, you couldn’t miss any stops out and so, if a stop wasn’t for you or was completely pointless, you just had to go with it. 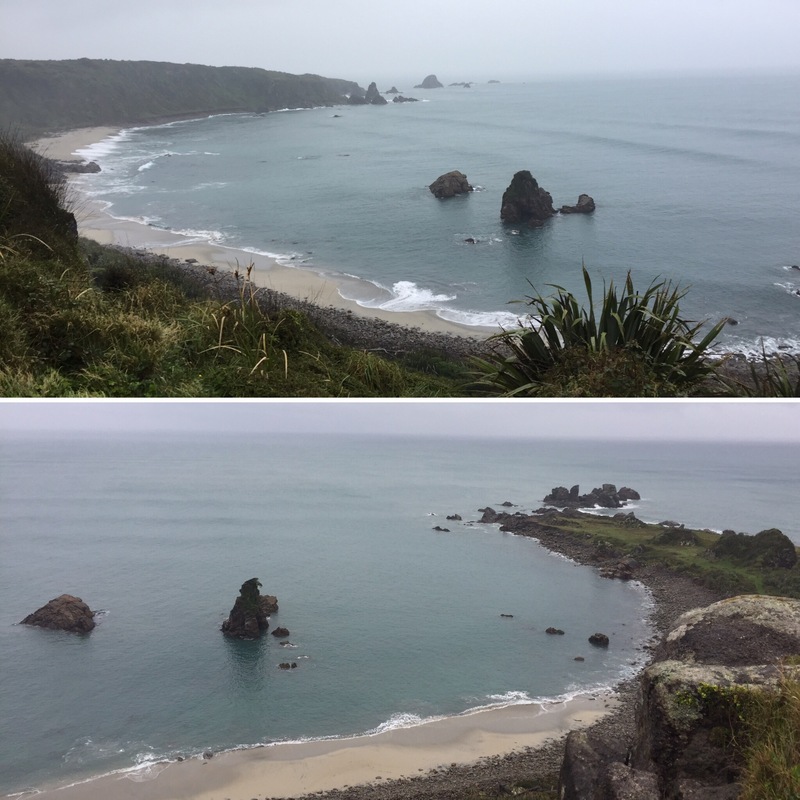 The aim of this place was to have a fancy dress party – the place has one every night – and we even stopped off at a place called Greymouth (an uninspiring place suited to the name) to get things for our costumes. Me and Niall didn’t fancy spending money on costumes so we just chanced being able to get things from previous outfits left behind at the accommodation. 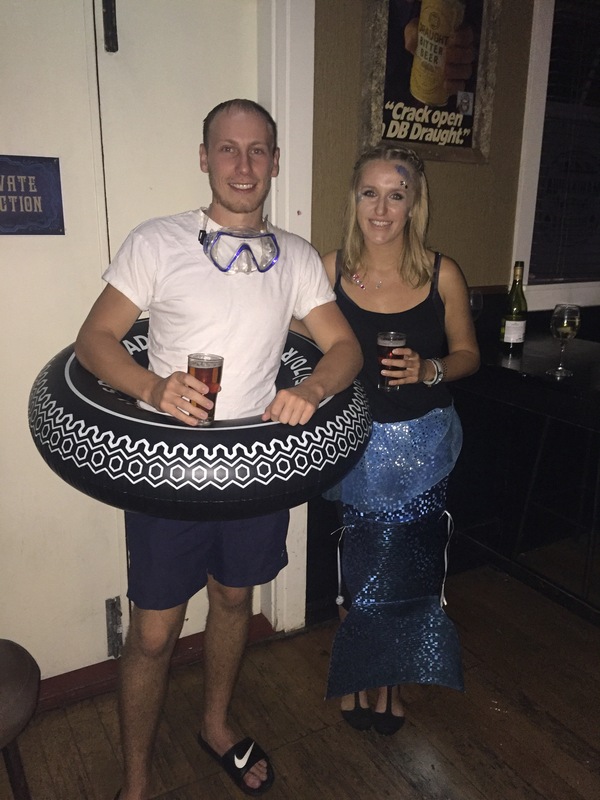 Our fancy dress theme was ‘under the sea’. This stop turned out not to be completely pointless as the charity shop had a waterproof jacket on sale for $10 which fit Niall and so meant he had a waterproof for the rest of our trip! When we got to the lake the place we had to stay at didn’t have a kitchen so you HAD to pay for their food that night. It was $55 for a meal, the room and breakfast. Everyone was quite annoyed by this as there wasn’t an alternative and we all wanted to budget so $55 was quite a lot to be expected to pay. The meal was pulled pork with potato, veg and gravy but the vegetarian option (which I had) was a roast veg salad with the potatoes and veg – so not really a very good option – just a big bowl of vegetables cooked in different ways (the garlic bread was good though). The rest of the day you could either chill in their hot tubs – which is what the lads, including Niall, all did – or carve some New Zealand green stone to form a bracelet or necklace. 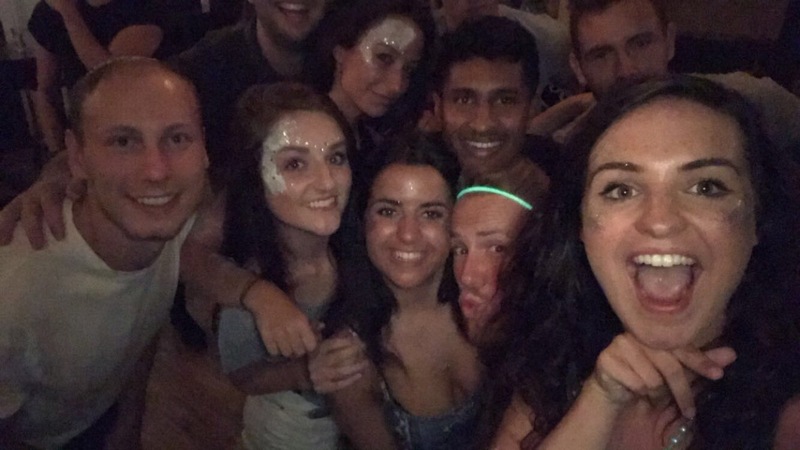 There were around 5 of us that did this and I made a bracelet – everyone else made necklaces. To make the jewellery you pick a piece of green stone and draw in pencil the shape you wanted it to be. This could be a simple shape (I chose an oval) or something a lot more complex like a Kiwi bird. 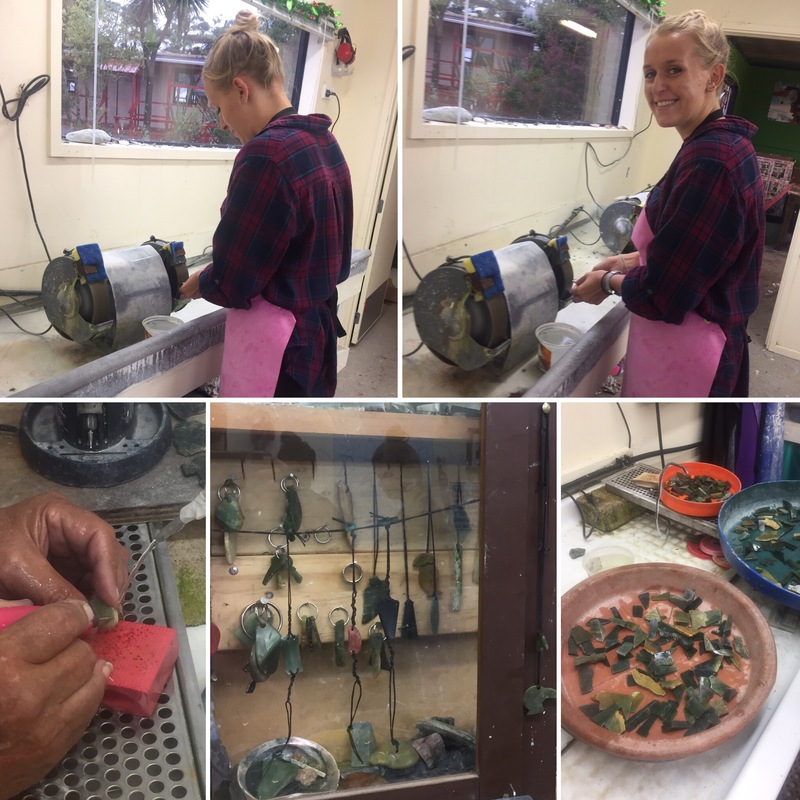 You then use a diamond grinder to grind the stone down to the desired shape. 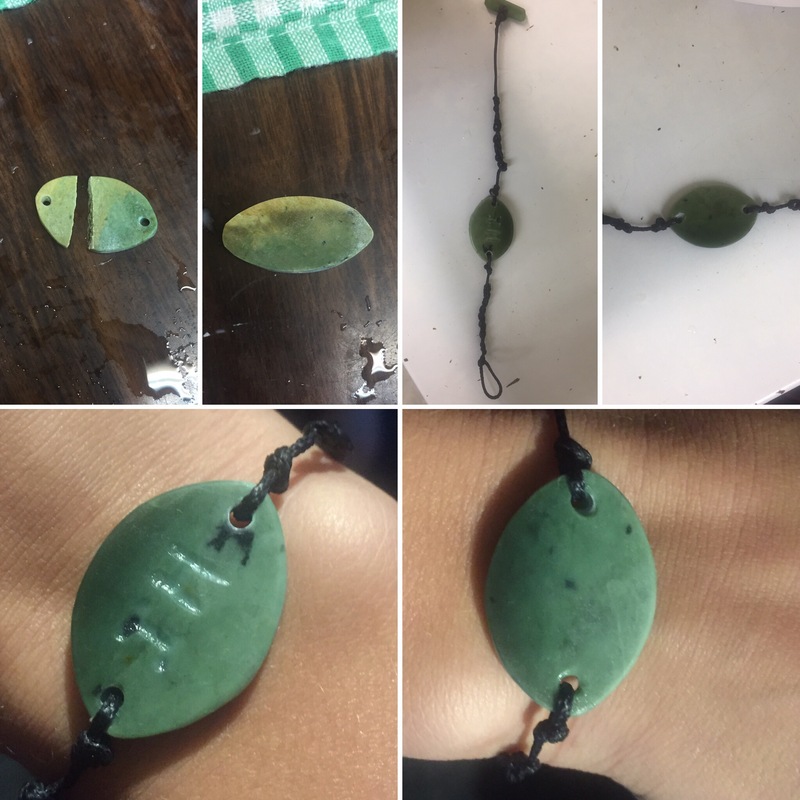 My first attempt went well and I was in the final stages, having carved it down and drilled holes into the corners for the string that would turn it into a bracelet. Whilst our carving instructor was attaching the stone, he snapped it in two so I had to start all over again! His meant I ended up finishing last instead of first and had to find a thicker bit of stone to make a new bracelet out of. I’m happy with the final outcome through. 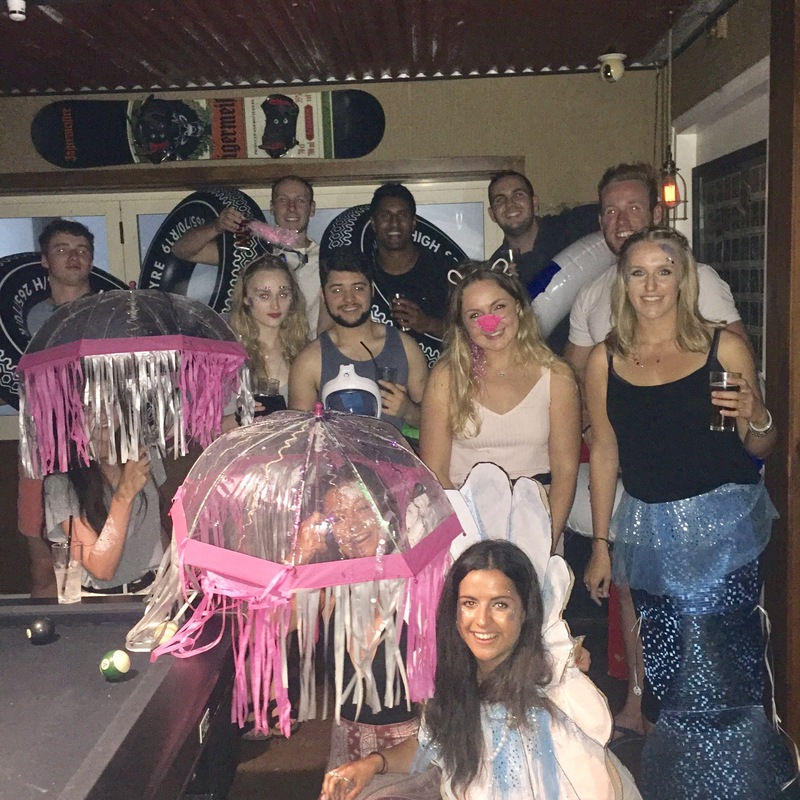 As I mentioned, the hotel has a fancy dress party every night which is just so odd to me to have that as your home and have the same thing happen every night of the week – saying that they must make an absolute fortune if you have a bus or two staying every night all paying $55 each! They have a costume room which is full of everyone’s left over costumes so I was able to find a mermaid tail to wear and then one of the girls from our bus, Emily, had gems and face paint so I used that. Niall, as well as the other lads in our group, all put on swim shorts and had inflatable rings around their waist. 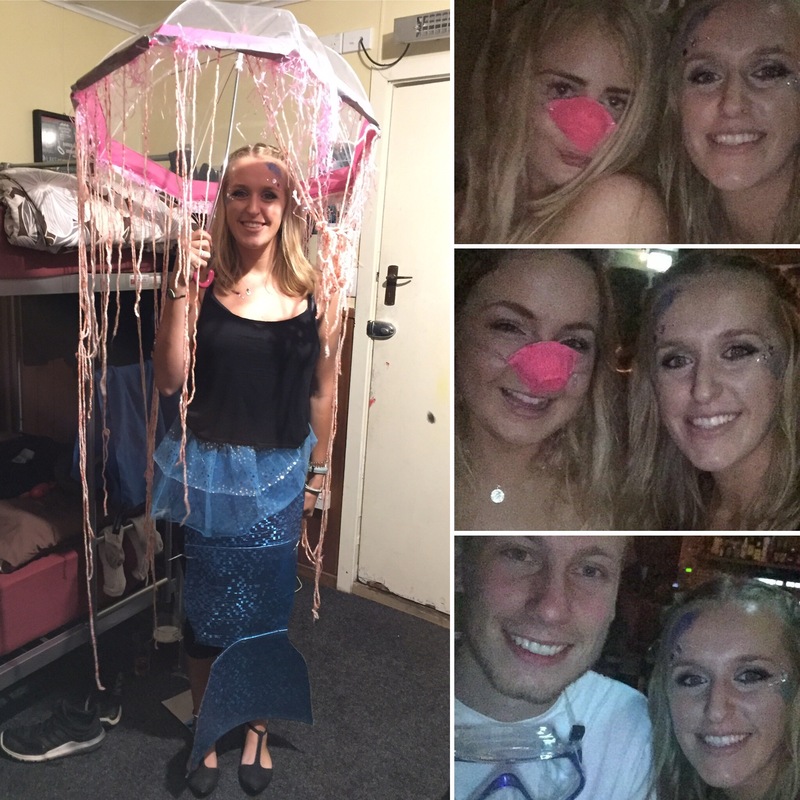 Two girls were dressed up as clams which were great costumes, two girls were jellyfish and Padraig was literally ‘under the sea’ (he had a cardboard C on his head – so clever!) 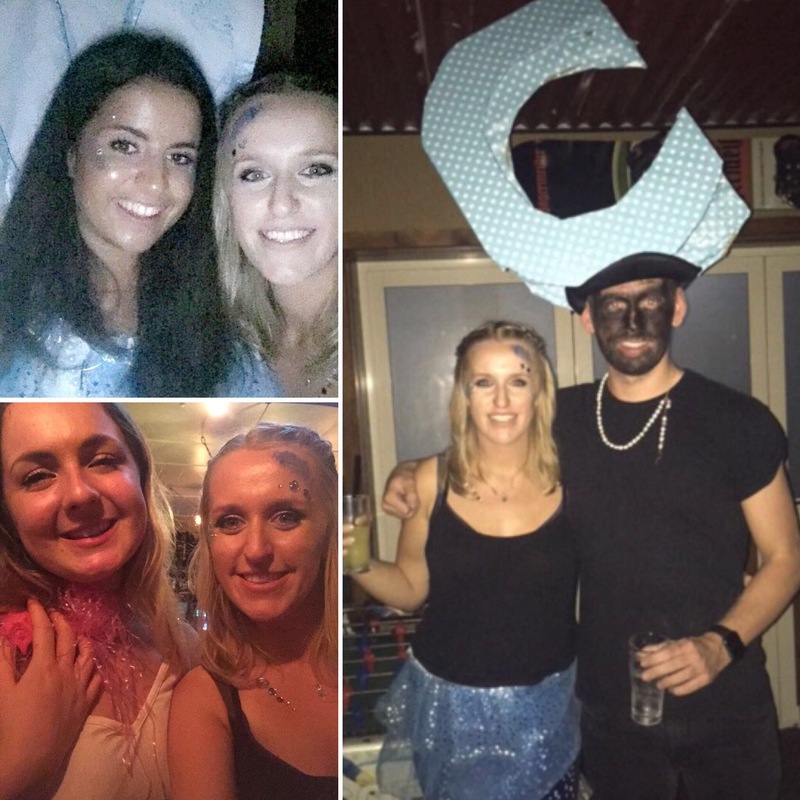 People dressed up as everything from sea weed to Jack from Titanic. Beth and Emma who are also in our new group were the pigs that swim in the Bahamas – the driver didn’t really understand that costume as much. Padraig and his friend Keith won the two main prizes of a canyon swing and a zip line which they definitely deserved as their costumes had been very good. 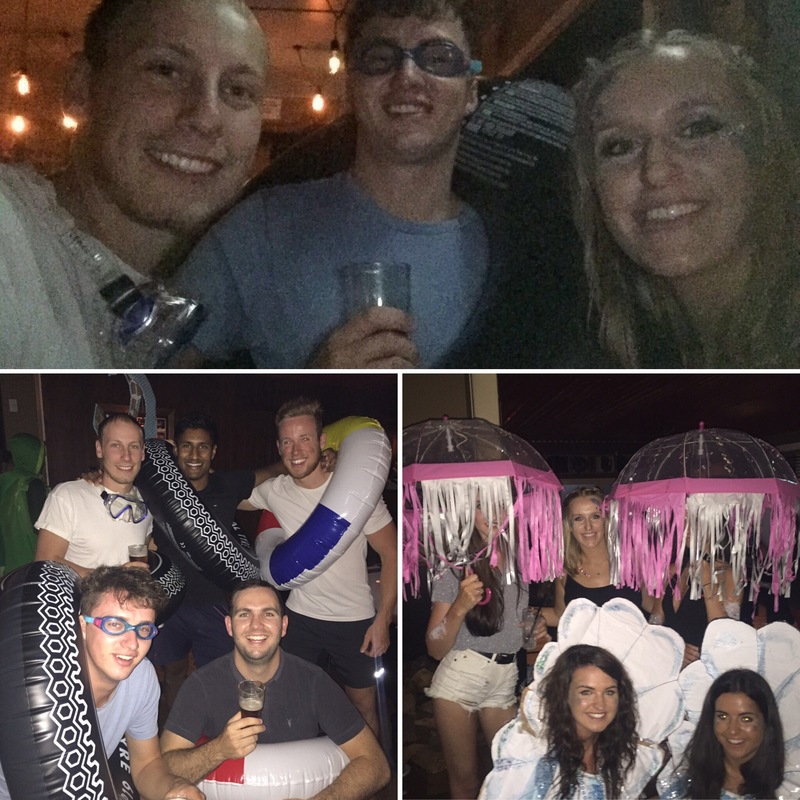 It was a fun night with us all getting to know each other better and I liked seeing everyone’s costumes so not a complete waste of a stop! The next morning we had lots of pancakes with maple syrup (and there was also bacon). To get our money’s worth we took a bunch of pancakes for our lunch and had them with chocolate spread whilst we were on the bus. The rain stopped the next day but it was still very cloudy so we didn’t get a chance to see Lake Mahinapua at all but that can’t be helped and we had seen some really pretty lakes already. All in all, we enjoyed the party but I still think the stop isn’t worth $55 for what we got.